The middle reaches of the Yorkshire Derwent were said to offer the finest scenery of any navigable river in Britain, but today, alas, they lie beyond our reach. This book outlines the history of the river as a trade route serving Malton, Stamford Bridge, and a number of smaller communities, which for some time competed successfully with George Hudson’s York & Scarborough Railway. 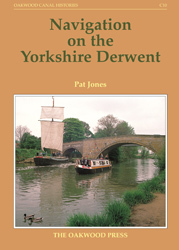 It tells how its attractions were enjoyed by visitors from York and Leeds. It describes the motor-boating era of the 1930s and the valiant but ultimately unsuccessful efforts to reopen all the river’s derelict locks. It also looks at nature issues and the equation of conservation with neglect, which ultimately contributed to the severity of the disastrous floods in March 1999. A5 format, 144 pages, 98 illustrations.